Assisting victims of war and poverty. Haiti is the poorest country in the Western Hemisphere. A succession of corrupt leaders and misguided interventions by foreign governments left the country bankrupt and without an infrastructure to support civilian life. In 1991, a new, democratically elected government headed by Jean-Bertrand Aristide gave promise for socioeconomic change in Haiti. This period of hope was short-lived. Aristide was removed from power by a military coup within one year. The United Nations adopted global sanctions against Haiti and an international military intervention returned Aristide to power. Unfortunately, the coup and the sanctions caused further deterioration of the deplorable socioeconomic conditions in Haiti. In 1991, The United Nations Development Program ranked Haiti 125 out of 160 countries, and in 1998, Haiti ranked 159 out of 174 countries worldwide. Haiti’s eight million inhabitants live primarily in rural, densely populated regions of the island. The absence of a public water supply, sewage system, and electricity, except in sections of the capital, Port-au-Prince, has led to a continual crisis in health care in the country. A child born in Haiti at the present time will have a difficult time surviving childhood and of living a decent life. More than 7% of Haitian children die before their first birthday. 13% of children never reach their fifth birthday. Malnutrition, low vaccination rates, and rampant infectious diseases, particularly infectious diarrhea and pneumonia, are the major causes of the extraordinarily high childhood morbidity and mortality. The health situation for girls is particularly desperate. Haiti couples the highest fertility rates in the Americas with the highest maternal mortality rates. 15% of maternal death occurs in teenagers. The frequency of AIDS and other sexually transmitted is extraordinarily high in Port-au-Prince and in the rural areas as well. The World Health Organization estimates that 6000 Haitian children will die annually of AIDS by the year 2001. Sr. Jackie Picard, RN examines patient in clinic. Health Care in the Gros-Marne District. The town and district is 175 kilometers north of Port-au-Prince in northern Artibonite province. Twenty-seven thousand people live in the town and an additional 100,000 people live in the surrounding mountainous region. As in many other rural area of Haiti, there is no public water supply, sewage facilities, electricity or reliable way to communicate with the rest of the country. Dirt roads, to and from the town, are in poor condition and are impassable during the rainy season. The Alma Mater Hospital in Gros-Morne has been designated the district hospital by the Haitian Department of Public Health. The Government has no funds to support the hospital or public health programs in the District and responsibility for health care has been given to the Roman Catholic Diocese, which provides modest but inadequate resources to address the many critical health problems. Alma Mater Hospital consists of five small, one-story cinderblock buildings with open windows and tin roofs. There are separate buildings for adult men, women, pediatrics, obstetrics and a minor surgery/laboratory suite. The buildings are rundown, unhygienic and generally unsuitable for housing sick patients. There is a pharmacy that stocks essential medications and provides drugs to patients for a fee. The laboratory is not equipped to perform basic clinical blood or urine test. The hospital owns an ambulance in good running conditioned. There is one physician and three nurses who serve the 127,000 residents of Gros-Morne. 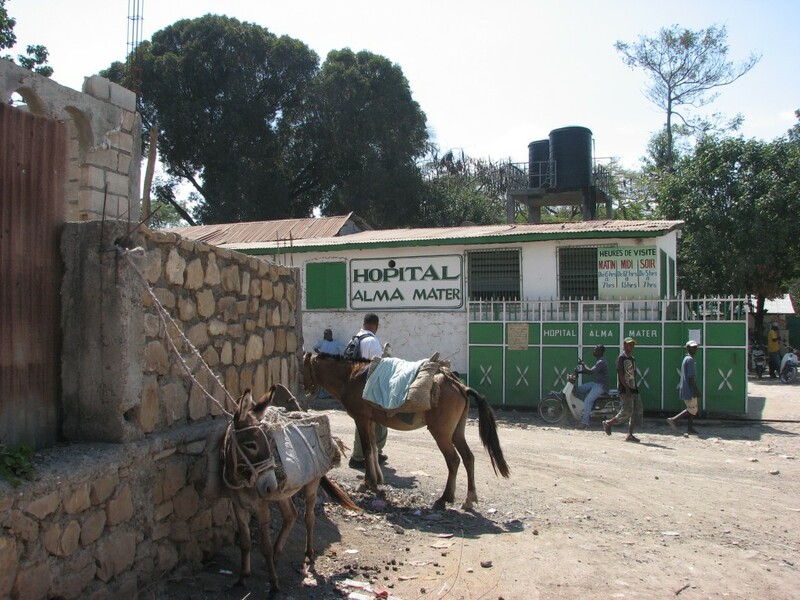 The hospital is supplemented by eight dispensaires (clinics) in the surrounding area, usually in extremely remote places in the mountains. The aides are below the level of a nurse but have taken a number of courses in health care delivery, particularly in midwifery and emergency medicine. A few of the aides are competent but the remainder are incapable of handling the medical problems they routinely face in the clinic. The aides are assisted by 10-15 agents de santé who are community residents who assist with the operation of the clinic, for example, transporting a patient from home to the clinic. The aides and the agents de santé receive no compensation from the government or from the Catholic diocese but receive a small remuneration from the local community. There are no reliable statistics on the general level of child health in Gros-Morne (e.g. infant mortality, childhood mortality, vaccination rates and nutritional status). Neither the Alma Mater Hospital nor the dispensaires maintain data on the number of ambulatory care visits, admissions, diagnostic categories, and numbers of births or causes of death. The Medicine For Peace Program in Gros-Morne. 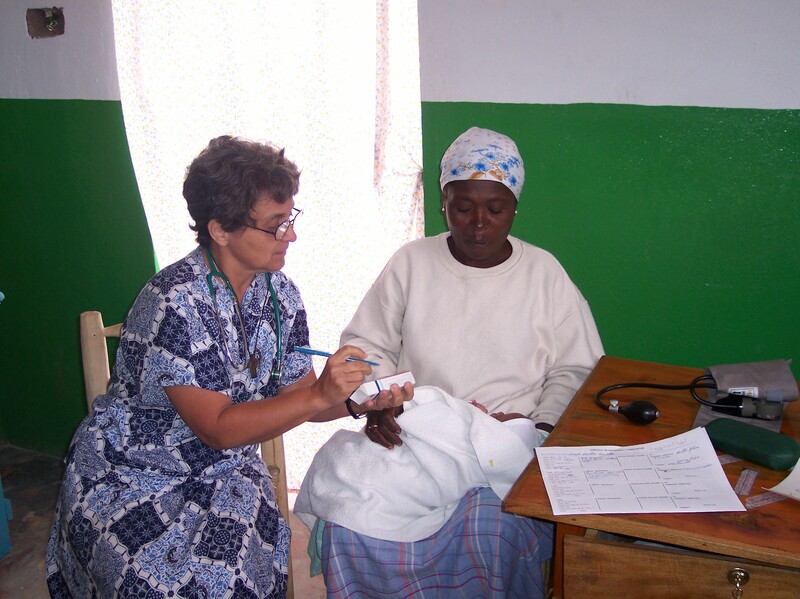 In January 1999, MFP received an invitation from the Haitian Department of Public Health and the Catholic Diocese of Gros-Morne to evaluate and implement a health program in the district. The Haitian Government does nor provides financial support for health care services, hospital maintenance or for public health programs. The burden of developing and supporting both public health and health care delivery programs is left to the Catholic Church and non-Governmental organizations, primarily from foreign countries. A MFP team spent one year evaluating the resources in the community and assessing the magnitude of the medical crisis in the town and the surrounding areas. Since that time we have embarked on health assessment projects, water purification, house construction, disaster relief after the earthquake and hurricanes, medical care delivery in rural clinics (Shaab, Pendu), and our present focus which is a women’s health initiative based in Alma Mater Hospital with mobile health units that travel to rural dispensaries. The centerpiece of the women’s health program is a cervical and breast cancer detection program. Please visit our blog for updates on our health programs in Gros Morne district.